I've posted about Ruby before, but she's making the news again, because she is one cool pup. She had been left to die along with her brother, was saved, patched up and ended up in the home of Pat Bettendorf . And thus began her ascent into the world of therapy dog work. She visits nursing homes, mostly places of forgotten people. She gets them to talk and open up. 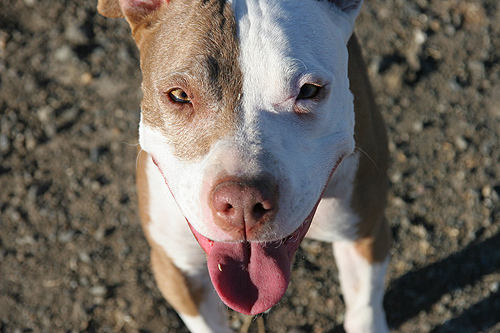 Her perk is the attention she receives - happy pit bulls are attention seekers. In a tangential way, the story reminded me of an experience I had about six, maybe seven years ago.I had just left a storage facility and was waiting for the gate to open. Mina was in the car and, for one brief moment, I let her splay herself on my lap, her mushy head flung happily out the window. As I started to pull forward, a woman's voice reached me, "Excuse me, wait please!" I stopped, peered around Mina's head for the source of the sound. A woman in her late seventies with brilliant white hair approached. She stopped and just stared at Mina, taking her in, nodding her head and finally politely asking if she could pet Mina. Oh, of course! Mina bestowed kisses as all happy pit bull are wont to do, and I learned all about the woman's old dog. And by old, I mean 1930s old. She was a spry, lithe farm dog who looked strikingly like Mina. She followed this woman everywhere, across fields and meadows, through the cattle pens, into the house, through the years. That dog was an icon, of her family and the hardships they endured, of lasting friendships and devotion. She never, ever forgot that dog. It was nice being part of that moment, to see her bond with Mina and imagine a Mina-dog doing for this woman what she has done for me - be a source of unconditional love, annoyance, fascination and fun. Perhaps what I liked most of that encounter is the lack of supportive statements. There was no "Oh, they get such a bad rap" or "it's all how you raise them", no attempt at offering sympathy for choosing a type of dog with such an uphill road to travel. It was just me, Mina, this woman and the memory of a devoted companion. It's a small experience I will never forget, and it made me cherish Mina and the American Pit Bull Terrier all the more. The joys and annoyances of fostering dogs! TIME: Can attack dogs be rehabilitated? Maningrida dogs kill man, what should be done?